As I appear to be obsessing on marshmallows of late, I have to include the newest item to hit my wish-list: Jet-Puffed Fruit FunMallows in Orange, Strawberry, Lemon and Lime flavors! Ok, so the Strawberry flavor wasn't such a winner but I hold out hope that the citrus varieties will be more pleasing. Bring it on! 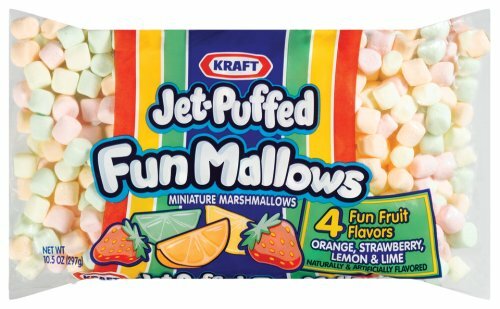 Can I ask you where you got your Kraft Funmallows? I need them for a recipie and I have been all over NYC trying to find them with no luck :( Thx! Unfortunately, I found them in a random bodega in Brooklyn. If I find them at a major retailer I'll definitely leave a note in the comments section! Good luck! Backlog: Nestle Yorkie, It's Not For Girls!